Pictured above: Glock 19 Gen 4 in a PHLster Skeleton, Skeleton Mag Carrier, Kershaw Turbulence. View a high resolution version here. The PHLster Skeleton remains one of my all-time favorite minimalist holster designs. 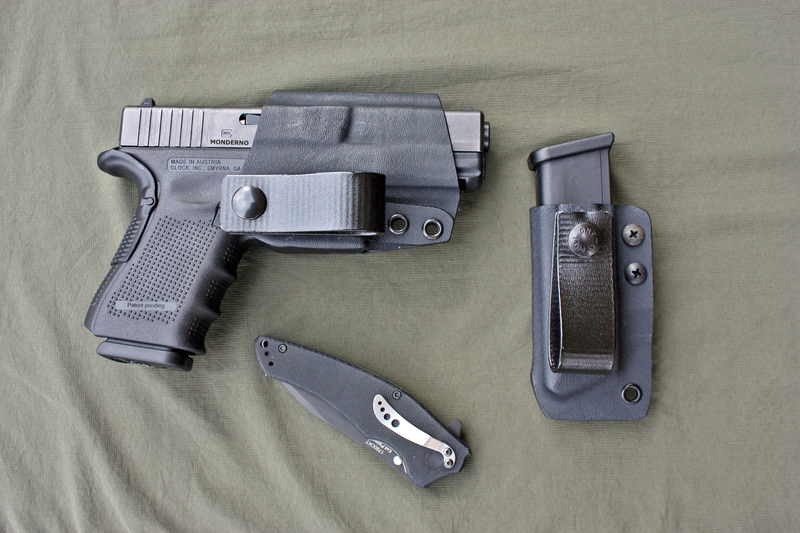 It’s a small, well-made holster that has a ton of features like ride height and cant adjustment among others. If you’re looking for a minimalist holster, start there. After the success of the Skeleton design, it was only fitting that PHLster come out with a magazine carrier based on the Skeleton holster, and now they have. The Skeleton Mag Carrier is an inside the waistband (IWB) Kydex mag carrier that attaches to your belt with one of the excellent PHLster soft loops. I’ve been wearing one for a month or so now, and I think it’s a great addition to anyone’s concealed carry gear. Mag carriers have features? This one does! The Skeleton fits virtually any 9mm, 357 SIG and .40 S&WÂ double stack magazine. I say virtually because I obviously haven’t tested every pistol on the market, and I suppose there’s a chance it won’t work for some pistol somewhere out there. But I’ve tried Glock, Smith & Wesson M&P, Springfield XD, Ruger SR9, and a couple different SIG’s and they all fit with minor adjustments to the tension screws. In addition to having tension adjustments, the Skeleton mag carrier is adjustable for cant, ride height, and belt width. Here’a video from PHLster showing the fit and adjustment features. As mentioned, I’ve been carrying the PHLster Skeleton Mag Carrier for about a month now and so far so good. It conceals well and has plenty of adjustments that allow you to get it in whatever position works best for you. Like all PHLster products, quality is outstanding. Value is also a big win on this one – at the time of writing you could buy a PHLster Skeleton Mag Carrier for $35 shipped. Not only is the price fair for a mag carrier, but you can buy once and use it for all of your double stack mags. If you’re looking for a mag carrier for concealed carry, take a look at the Skeleton. You’ll be hard-pressed to find a more well-made, flexible rig that offers this much value. I just bought this and the access holster. Hope they live up to the hype! Apendix carry is new to me so I’m a little on edge, lol.